If you have to make plumbing repairs around your home, it helps to understand your drain-waste-vent system (DWV). The fat pipes in your house make up the DWV, carrying wastewater to a city sewer line or your private sewer treatment facility (called a septic tank and field). The drainpipes collect the water from sinks, showers, tubs, and appliances. The waste pipes remove water and material from the toilet. The vent pipes remove or exhaust sewer gases and allow air to enter the system so that the wastewater flows freely. The drainpipes are made of cast iron, galvanized pipe, copper, or plastic. Local building codes that regulate the materials used in the DWV system have changed over the years, so most older homes have a combination of materials. 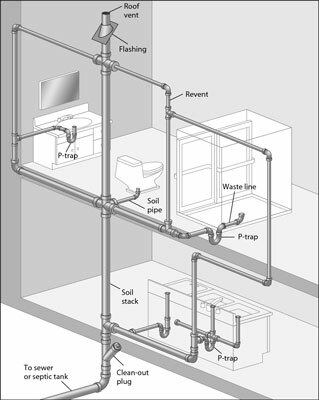 This diagram of a typical DWV system is called a plumbing tree. Water runs down the sink drain into a p-trap (so called because it’s shaped like the letter), which fills up with water to prevent sewer gases and odors from getting into the house through the pipe. This water gets refreshed whenever more water runs through it. A drainpipe attached to the p-trap goes into an opening in the wall. Behind the wall (where you can’t see), a vent line and drainpipe lead to a soil stack, which is the control center of the wastewater system. Drain pipes take the wastewater to the soil stack; through the stack, sewer gases are carried up to the roof through vent lines. All the faucets and water appliances in a house use this same system of drains, pipes, and vents. All the waste lines have a cleanout, which is a Y-shaped fitting that’s accessible so that you can clean out any serious obstructions within the system.